#50 How Much Money is Marketing Earning These Days? 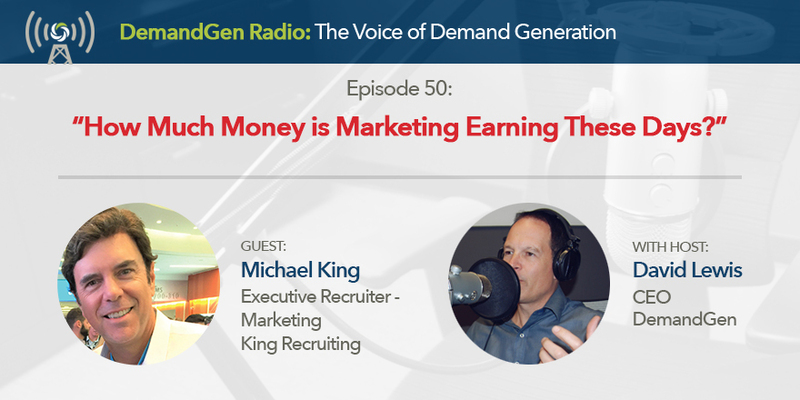 Michael King, founder of kingrecruiting.net has been helping B2B startups and mid-sized Pre-IPO companies in Silicon Valley and Seattle build out their Marketing teams…from the CMO down to the Director. On this episode, we kickoff learning from Michael about how much senior marketing leaders are earning these days and we highlight some of the new roles emerging in marketing you might consider. We also discuss LinkedIn posting tips for you, resume tips, how and when to use a recruiter, and how to know which opportunities are best for you -- like being a head of marketing operations versus demand generation or even CMO. You’ll want to connect with Michael because his passion is meeting a director-level marketer and then working with them until they become a VP, CMO, and sometimes even CEO.